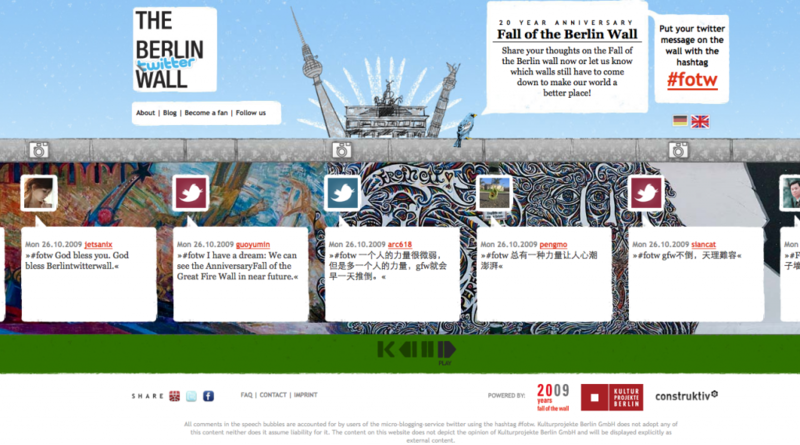 Chinese netizens taking over the virtual Berlin Wall. 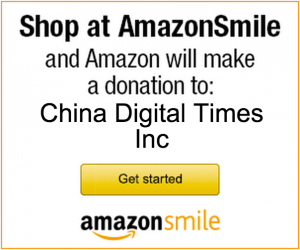 from China Digital Times on Vimeo. * ScrewTheWall http://www.berlintwitterwal… is a website that commemorates the 20th anniversary of Berlin Wall. All you need to do is to post a tweet on the Twitter that includes #fotw. 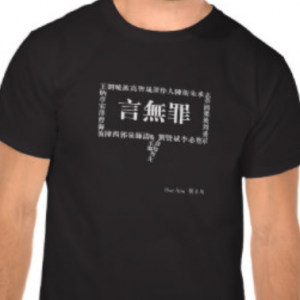 * Peterlue #FOTW All Chinese on the electronic Berlin Wall, spectacular! The Berlin wall has fallen, and so will the Great Firewall. * VcinVoice #fotw I always thought the promotion of science and education from the state was based on some real sincere wish for the people; now it seems that nothing, including the future of our own people, can get in the way of the so-called political stability. * sddzyubo #fotw Nothing can stop one’s quest for freedom. * miaofeng #fotw We climb the Great Firewall because it has blocked out all of the dissent, and we do so to eventually get rid of the Wall. 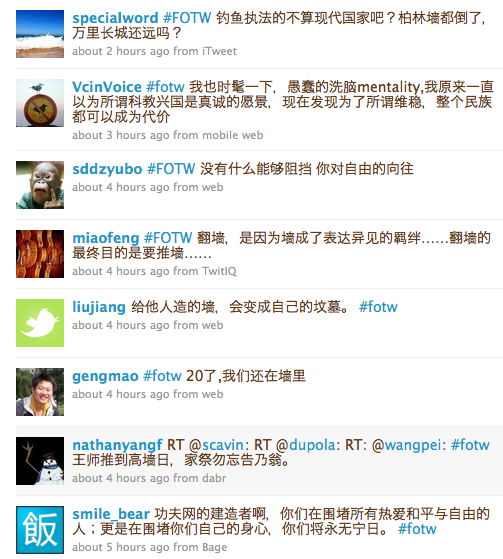 * gengmao #fotw It has been twenty years, and we are still in the Wall. Dodorz RT @mountain #fotw I hope in my remaining years I can see Fang Binxing on public trial at the court. 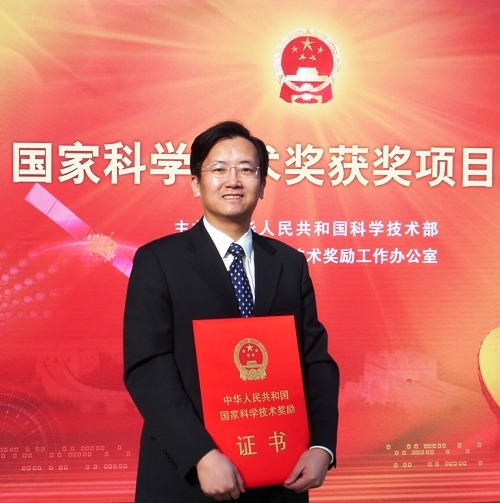 [Dr. Fang Binxing (方滨兴) , president of Beijing Telecommunications University, is the chief scientist of the state funded project “Dynamic Blocking System in Large Scale Broadband Networks” and the founding director of National Computer network Emergency Responses technical Team/Coordination Center of China (CNCERT), a.k.a. the Great Firewall. * petrelwz #fotw The existence of the Wall made us realize our capacity to jump. The wall is high, but we can always jump a little higher. * gnap #fotw Compatriots in West Germany, please throw a few more proxy addresses to this side. * Diyzh: my body could be walled, but my heart is always unblockable. * Yimaobuba #fotw As long as you don’t have a wall in your heart. 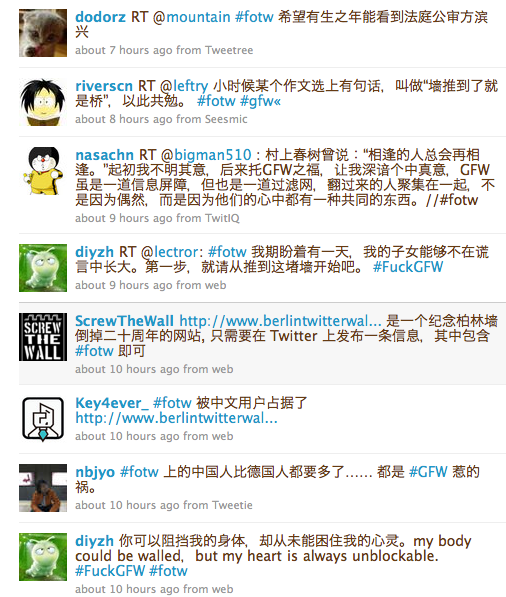 * Feixiangdiyiba RT @killbb RT @chooyes : RT @wowbanks : #fotw There’s a wall in the ancient oriental world, and its name is the Great Wall. Although I never saw how long the Great Wall is, I’m often blocked by the Great Wall while I’m logging onto the Internet. * ChrisicGong My apologies to German people a million times [for taking over this site]. But I think if Germans learn about our situation, they would feel sorry for us a million times. * jerio #FOTW it’s sad to see my 2 best friends join the CCP~~wait until GFW falls and there is no more corruption, then I can consider that. 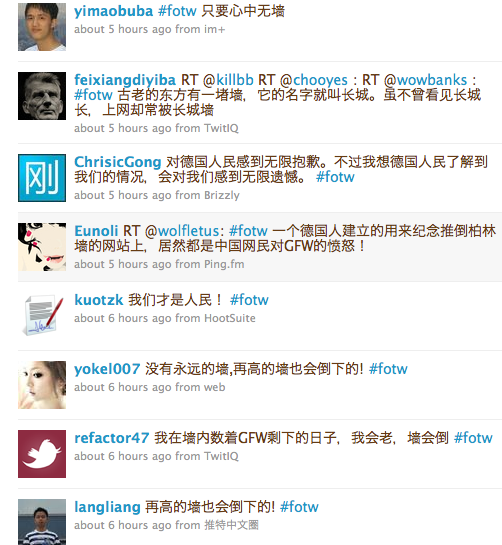 * Eunoli RT @wolfletus: #fotw The website established by a German to commemorate the fall of the Berlin Wall is full of the fury of Chinese bloggers at the GFW! The Berlin Wall is gone, but people can still tag their memories on it online. The Berlin Twitter Wall, which went online Tuesday, encourages people to share their memories of the wall’s collapse and hopes for the future on a scrolling wall using Twitter, the social networking site. By Wednesday, there were more than 100 comments in Spanish, English, German and French. Some said they were too young to remember the fall of the Berlin Wall on Nov. 9, 1989. Others called upon people to help carry the memory into the future.The online wall is part of events organized by the city of Berlin to help mark the anniversary of the event that paved the way for a reunited Germany and Europe. …… Twitter lets users post 140-character messages, which can include a hashtag, a Twitter convention grouping all tweets on a particular subject with a tagline preceded by the pound sign. The hashtag for the Berlin Twitter Wall is (hashtag)FOTW and there is a Twitter account called “FalloftheWall” that provides daily updates detailing historic events surrounding the Berlin Wall. It was supposed to be a place to remember where you were and what it meant to you on Nov. 9, 1989, when the Berlin Wall fell between East and West Germany, marking the beginning of the collapse of communism in Eastern Europe. But something very different – and fascinating – is happening instead at the Berlin Twitter Wall, a website that went online last week as part of the city of Berlin’s anniversary celebrations. 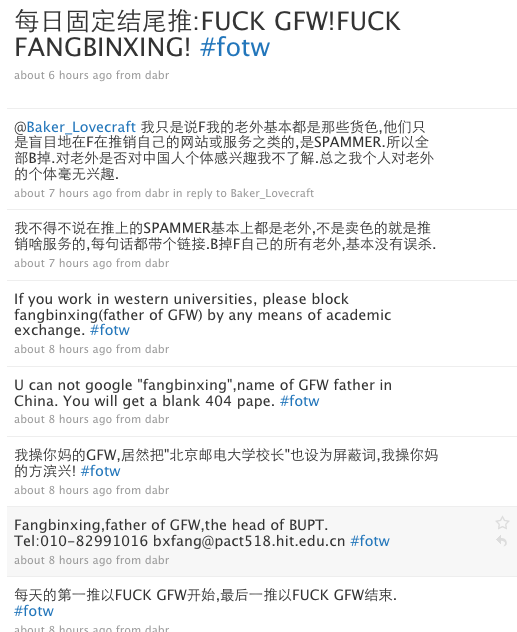 Instead of reminiscences about life behind the old Iron Curtain, the site is being overloaded with complaints about a new barrier sealing people off from the outside world: China’s thick web of Internet censorship, referred to locally as the Great Firewall (or GFW, in character-saving Twitterspeak). Most of the writers posted in Chinese, and claimed to be doing so from inside China, where Twitter and dozens of other popular websites have been blocked by the Communist government headed by President Hu Jintao. (Click here for an incomplete list of the banned sites.) Blocked sites can be accessed from inside China via virtual private networks, provided you have both a private computer and the tech savvy to do so. The entire province of Xinjiang – home to 21 million people – has been almost completely without Internet service since deadly ethnic riots hit the city of Urumqi on July 5.